It's not normal for a cat to vomit daily or even several times a month. If your cat is vomiting frequently, it may be due to a simple issue like hairballs, or it could indicate that your cat has eaten a toxic substance or has a serious illness. Whatever you suspect the reason may be, see your vet about it as soon as possible. Only after a thorough examination can you get an accurate diagnosis and learn about your treatment options. A number of different conditions and circumstances can cause a cat to vomit repeatedly. It may either be a passing thing or a symptom of a serious health concern. In any case, the key to correcting the issue is to identify the cause. One possible benign cause for frequent vomiting is that your cat is eating too much food too fast. This can happen to any healthy cat; watch for it to vomit barely digested food soon after eating. Corn is one of the most common food allergies for cats, and wheat is another known allergen. Unfortunately, both of these are often found in dry food, sometimes appearing in several different forms. These types of ingredients are unnecessary in cat food because cats are carnivores and don't need grains of any kind to thrive. This is likely why so many cats have issues with foods that aren't grain free. Sudden vomiting may also be caused by poisoning, which is a veterinary emergency. If you suspect that your cat (or any pet) has eaten something poisonous, call your vet or the Pet Poison Helpline immediately. Antifreeze: The ethylene glycol in antifreeze is attractive to cats and dogs because of its sweet taste. The symptoms include nausea and vomiting. When you buy antifreeze, look for those that use propylene glycol as an agent, which the U.S. Food and Drug Administration has labeled as nontoxic. Other home and yard toxins: Human medications, toxic cleaners, insect sprays, and yard and garden sprays to control weeds and pests all have the potential to poison your pets. Recalled cat food and treats: Whenever you hear news of a pet food recall, take notice as these can potentially contain dangerous toxins. Read about the affected brands of food; then check to ensure that you don't have any in your home. If you do, follow the recall instructions and dispose of it immediately. Feline irritable bowel disease or irritable bowel disorder is another cause of vomiting, usually accompanied by diarrhea. This disease can occur anywhere in a cat's intestinal tract, including the stomach (gastritis), the small intestine (enteritis), or the large intestine (colitis). Pancreatitis is an inflammation of the pancreas, which is part of the endocrine and digestive systems of the cat. Along with vomiting, the potential symptoms include lethargy, diarrhea, fever, and an unwillingness to drink water or eat. Eventually, many aging cats develop chronic renal failure (CRF). The kidneys are often one of the first organs to fail because these organs are a workhorse in the body, filtering waste, balancing nutrients, and controlling blood pressure, among other functions. Symptoms of CRF often include vomiting, lethargy, diarrhea, weight loss, and increased water consumption. The earlier CRF is detected, the more treatment options are available. Diabetes is another disease of the endocrine system that can affect cats. As with pancreatitis, vomiting is a common symptom of diabetes and often one of the first signs that something's wrong. Other symptoms to look for include increased thirst, hunger, and urination as well as weight loss and muscle weakness. Frequent vomiting that occurs along with increased appetite and weight loss are strong potential indicators of hyperthyroidism or an overactive thyroid, which is part of the endocrine system. You can also look for symptoms such as irritability, diarrhea, weakness, and excessive thirst. Additionally, your cat's fur may appear as if it's not being groomed as normal. Although vomiting is not a primary symptom of hepatic lipidosis (commonly known as fatty liver disease), it sometimes presents as a symptom. This disease can be fatal; however, it's often reversible, provided that it's quickly diagnosed and treated. Although cat caregivers often joke about hairballs, they're really no laughing matter. If hairballs are not vomited up, they may work their way down the intestinal tract and eventually pile up in one place or another. This can cause a sort of fuzzy "logjam" or bowel obstruction that may have to be removed surgically. If you notice that your cat has vomited on two consecutive days, give your vet a call immediately for guidance. Your veterinarian will likely ask you a few questions that will help determine if it's a medical emergency or something you can observe or treat at home. The treatment for your cat's vomiting depends on the underlying cause. For instance, treatment for feline irritable bowel disease often includes medication and a limited-ingredient cat food or raw food diet to eliminate food allergies. In the case of kidney failure, your vet may recommend blood pressure medication and increasing fluids. Surgery or anti-thyroid medications may be required to treat hyperthyroidism. 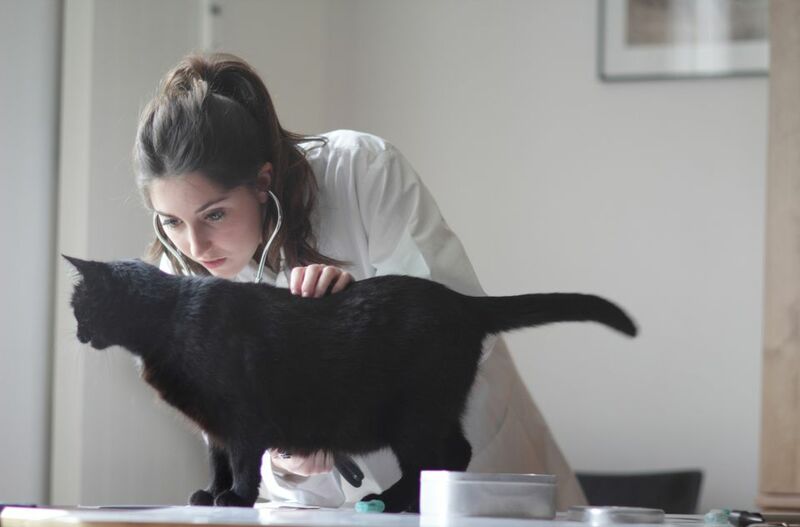 Your vet will guide you through the options and help you make an informed decision based on your cat's specific needs. When your cat seems to be devouring its food too quickly, try to slow things down. You can feed smaller meals more frequently or offer the food on a paper plate rather than in a bowl. An automatic feeder may also help. If the cat still vacuums up the food and then throws it up, put an inedible object (e.g., a golf ball) in the bowl. The cat will eat around the object to pick out the food, forcing it to eat more slowly. Be sure that anything you put in your cat's food is clean and large enough so your cat doesn't accidentally swallow it. If you suspect food allergies, it might be time to switch what you're feeding your cat. Look for grain-free cat food and be sure to read the ingredients carefully. Regular veterinary exams are always a good idea. Your vet can often see signs or symptoms of medical conditions in the early stages, which can help with the treatment. To prevent the possibility of poisoning any of your pets, always keep toxic chemicals, medications, and other potentially hazardous items out of your pet's reach. Keep in mind that cats are curious and can get into or jump on things you might not suspect. Make sure there are no antifreeze spills on your garage floor or driveway and try to keep your cat out of the garage, just to be safe. It's also a good idea to pet-proof your home on a regular basis so you don't accidentally miss anything. Regular grooming and discouraging your cat from being obsessive about it can prevent many hairballs. Frequent use of a high-quality cat brush or deshedding tool will go a long way toward preventing a veterinary emergency. You can also try hairball-reducing food that includes more fiber. Mild hairball laxatives are available as well. These are designed to help any hairballs move more smoothly through the digestive tract.